The next Total War game will be set in China circa 190 CE, famously depicted in the historical novel Romance of the Three Kingdoms. Creative Assembly appear to have jumped the gun in announcing Total War: Three Kingdoms, first by a quickly-deleted Tweet “announcing a new Total War era” which linked to a countdown pointing toward tomorrow, then by an early YouTube livestream revealing the trailer. If you’re still down for fantasy battles, check out our guide to the Tomb Kings in Total War: Warhammer II. 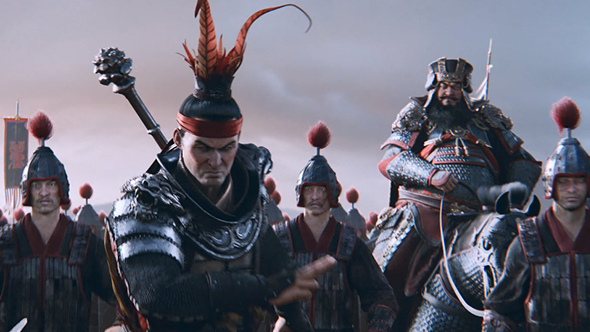 The first trailer for Total War: Three Kingdoms is light on gameplay details, but does set the tone with lavish CG. It does place a focus on “champions,” which suggests the game might expand on the legendary hero unit mechanics from Total War: Warhammer. Total War: Three Kingdoms is the first full historical Total War game we’ve seen in a few years, marking a fresh step after both the fantastical Warhammer games and the smaller Saga titles. According to the game’s Steam page, Total War: Three Kingdoms is set to launch for PC on September 6 2018. This has since been edited back to Fall 2018, but we promise it was there.